How do I assign submissions to team members for review? With the Assignments feature, you can easily assign submissions to team members and invite team members to your organization's account, all within the Assignments window. 1. In your Submissions list, optionally use the search filters to locate submissions by specific search criteria. Select the checkboxes next to the submissions you'd like to assign. 3. In the Assignments window, below the 'Search by name or email' box, click on the name of any existing team member to whom you'd like to assign the submissions. The number of submissions assigned to that team member, as well as their permission level and optional title, will show next to their name. 4. If you're assigning team members to multiple submissions that are already assigned to different sets of team members, you will see a Manage existing assignments button in the Assignments window. Click the Manage existing assignments button to see which team members are assigned to all of your selected submissions and which team members are assigned to only some of your selected submissions. You can optionally unassign team members from their existing assignments by clicking the X next to their name. Add in any additional assigned team members and an optional message. Then, click Update Assignments. 5. Team members will receive an email notifying them about their assigned submissions. They can then sign in to review, comment on, and rate their assignments. Any new team members you invite to your organization will receive an email (to the email address you used when inviting them) that contains an acknowledgment link that they must click to complete the signup process. 6. Follow the steps to automatically assign team members to incoming submissions for a specific form. 1. In your Submissions list, click the name of the submission to go to its details page. 2. 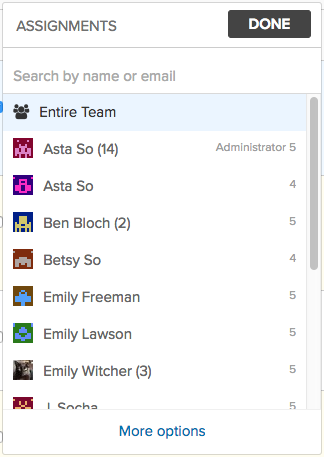 In the submission's details page, click the Assign to Team Member icon (shown below) at the top of the screen. 3. In the Assignments window, below the 'Search by name or email' box, click on the name of any existing team member to whom you'd like to assign the submission. The number of submissions assigned to that team member, as well as their permission level and optional title, will show next to their name. To assign all of your organization's current and any future team members to the submission, click Entire Team. To unassign a team member, click the X next to their name. To add an optional message for your reviewers, click More options. 4. Team members will receive an email notifying them about their assigned submission. They can then sign in to review, comment on, and rate their assignments. Any new team members you invite to your organization will receive an email ( to the email address you used when inviting them) that contains an acknowledgment link that they must click to complete the signup process. 5. Follow the steps to automatically assign team members to incoming submissions for a specific form. Submissions with more than one reviewer assigned to them will be labeled Multiple Team Members under the Assigned column of the Submissions list. If you click on this label, it will show the names of the assigned team members. Related: How do I unassign submissions?